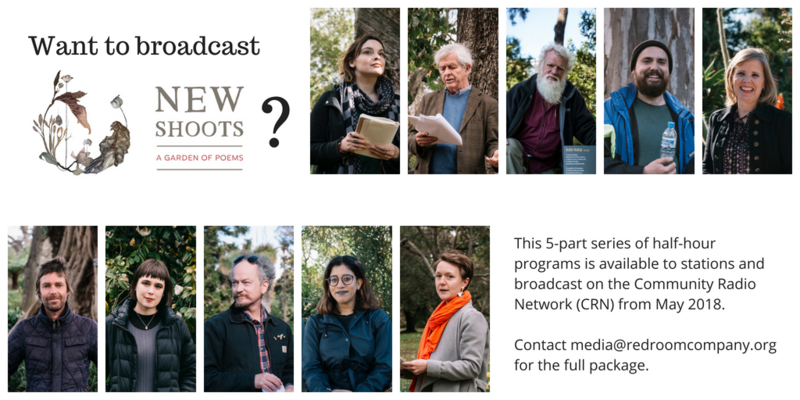 New Shoots Victoria is a Red Room Poetry radio series produced with the assistance of the Community Radio Network. Created by Red Room Poetry, New Shoots celebrates and cultivates poems inspired by plants and place to deepen cultural connections with nature. Red Room Poetry, in partnership with the Royal Botanic Gardens Victoria and Australian Poetry commissioned 10 Victorian poets to create work in response to plants and spaces in the Gardens. The poets then read their work at a New Shoots Victoria event, held at the Gardens during the 2017 Melbourne Writers Festival. The New Shoots radio series is produced by Prithvi Varatharajan. Music by Guillermo Batiz. In Episode One, New Shoots poet Carissa Lee Godwin shares her experience of “otherness” and of finding affinity as a First Nations person in the arms of the Monterey Cypress. While long-time friend of the Garden, Chris Wallace-Crabbe reflects on the many ages and memories of youth mapped by the trees, ponds and plants he has grown up with. New Shoots poets Bruce Pascoe and Ryan Prehn unearth the pre-colonial history of the Gardens in Episode Two. Sharing the story of the wise philosopher Kuller Kullup, Bruce reveals the history of the man who prophesied the falling of the sky after meeting missionaries at the site of the Royal Botanic Gardens Victoria. Ryan reconnects with remnant vegetation, weaving past with present through his encounters with biel, a 300-year-old remnant River Red Gum that has survived colonisation. New Shoots Episode Three explores Duncan Hose and Cameron Lowe’s humorous and critical observations of European botanical order and the fetishised lives of plants in the Royal Botanic Gardens Victoria. Their poems and reflections question our manipulation and mythologisation of the Gardens and our life with these plants. Secrets of fungi and sacred trees fill New Shoots Episode Four with poets Bonny Cassidy and Maria Takolander. Inspired by a collection of Malcom Howie’s vivid watercolours at the Melbourne University Herbarium, Bonny paints poems that bring botanical specimens back to life, while Maria surveys the spiked, surreal and arid plants of Guilfoyle’s Volcano. New Shoots Episode Five juxtaposes Elena Gomez’s succulent garden excavations with Autumn Royal’s wanderings in the camellia grove. Elena’s cryptic and imagined lives of plants on arid cliff-faces offer a kaleidoscopic contrast with Autumn’s camellia studies that carefully weave personal and taxonomic narratives.